Hiring a coach for a large group of tourists is a responsible task. Such important aspects as comfortability of the seats, extra amenities via CD/DVD players, a TV, available Wi-Fi, little refrigerators become a necessity. Therefore, once you are in Vienna with a large group of people under your responsibility, there is no better solution than entrusting their transportation to 8Rental bus rental service in Vienna! Only here you will be provided with a chance to choose among standard and business coaches to satisfy all your anticipations. Hire a coach in Vienna and experience high-quality service. Get your quote right away! Hiring a bus in Vienna with a professional driver is the first thing you should do when arriving in this city. Get a quote. Specify your order. 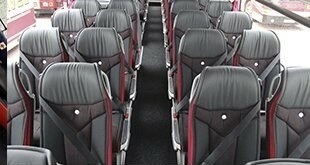 Request the price and confirm the booking to hire luxury buses. As soon as in a couple of minutes the coach you book will be waiting at the destination with an experienced driver. Feel free to contact us whenever you need - we are available 24/7. Are you traveling to Vienna with some large group of friends or colleagues? Or perhaps you have organized an excursion in the city for a large group of tourists and need to rent a chauffeured bus? In both cases, 8Rental is at your disposal! 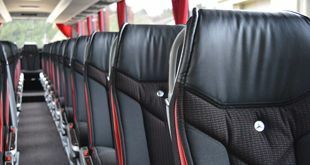 This Europe-based prominent coach rental service with drivers suggests booking standard Mercedes Tourismo immense bus dedicated for up to sixty-five passengers. With its eye-catching design, roomy and comfortable cabin, this bus provides fabulous rides not only on Vienna's roads but also through entire Austria. Mercedes Tourismo comes equipped with such amenities as reclining comfy seats with armrests, seat belts, air conditioning, reading lights, air suspension, toilets, refrigerators, hot drink facilities, DVD players, TVs, DC/USB players, etc. Don't hesitate, the convenience, spaciousness of the vehicles will amaze your guests. However, if you are welcoming a delegation of essential guests from abroad and want to impress them not only with the majesty of Vienna but also with luxury transportation in the city, 8Rental is here to offer you VIP options! Lavish VIP coaches enriched with elegant interior trims made of best and most expensive materials will satisfy VIP class passengers' needs. Rent a bus in Vienna with a driver specifying your requirements and have all them satisfied to the highest level! 8Rental is a flexible chauffeured bus rental service in Vienna. It works for its clients and puts their requirements above everything. All clients' insurance is guaranteed. This vehicle supplier is in charge of the fuel burnt during the order whether it's for an hour or the whole week. Our coach drivers are ready to welcome your group at the airport, bus or railway station and take you to your hotel. Ordering a bus with a driver in excellent condition, you have them at your disposal for your specified time. Vienna is one of Europe's most visited and most marvelous cities! The city owes its rich history and charm to its location - it's the gateway between Each and West Europe. Renting coach in Vienna with a driver, dedicating a couple of days to exploring this city, driving along its alluring roads will become the most memorable time in your life! In any direction you look, you see intricate architectural masterpieces, captivating atmosphere peculiar exceptionally to Austria, great bright colors. Make sure your guests see Imperial Crypt and Capuchin Church, have a cup of coffee at the famous Demel. The decidedly odd yet spectacular Hundertwasserhaus or "nature and human-friendly" house of Vienna is worth a visit, too. Rent a coach with a driver in Vienna to take you to all the sights this city has!